I’m sure you’ve come across many articles about the top household appliances for your home on lots of different websites, but I wanted to write something about this myself and add my own personal slant on why I’m choosing some of these for the roundup. It’s one of the hardest things to get right in a kitchen; balancing the practical with the stylish, but hopefully some of my tips will help you do this. I know it’s quite obvious, but there are some very stylish looking microwaves on the market and they’re pretty much an essential in any family kitchen. They can also be really inexpensive these days too. Do you actually ‘cook’ in your microwave? In the past, I have cooked a roast lamb in a microwave oven, but these days I just use them for defrosting and heating. Having said that, as a busy family I’m not sure we’d be without it, and I know when we’ve been on holiday without one, it has been an inconvenience. I’ve included the washer dryer here because I love the space-saving element of combining these two features, and often you save money too. Again, with a busy family and a tonne of washing, a dryer is pretty much essential and hard to live without, particularly once you’ve had one. Choose one with an ‘easy iron’ function like these from Amica too, to help with the ironing workload later. I didn’t have one of these until a few years ago, not really understanding or valuing their worth. Since then, however, I’ve used it extensively and found it invaluable on busy days when we’re out all day but still want a tasty family meal on the table when we walk through the door. I’ve found lots of websites and blogs too, that have great recipes and helpful hints to make the most of your slow cooker. Unless you really don’t ever cook or bake, a food mixer or blender is another essential household appliance in every home. Use it to simply chop up the veggies, whisk up a smoothie, make a cake mixture or create a blended recipe, the uses are pretty much endless and they last for years too. Again there are some very cool looking examples on the market which would look stylish left out on the kitchen worktop as a feature in the room. I love the convenience of the cordless vacuum, even though you can only use mine for 20 minutes at a time, I find that’s plenty for me. I also love how you can easily pick it up out of its charger for the smallest of jobs, jobs that I probably wouldn’t bother tackling if I had to get the full blown corded version out of the cupboard. They’re stylish and take up less space generally than other vacuums. This one is a definite winner in my eyes. Ok, now I now this is probably an indulgence, but I do love my Nespresso (other coffee machines are available of course!). Working from home I love to make myself a coffee, and it’s quite a treat at weekends too. They look great – I have a slimline version – and blend beautifully into the rest of the kitchen. Again, another one to add to the stylish and practical list. 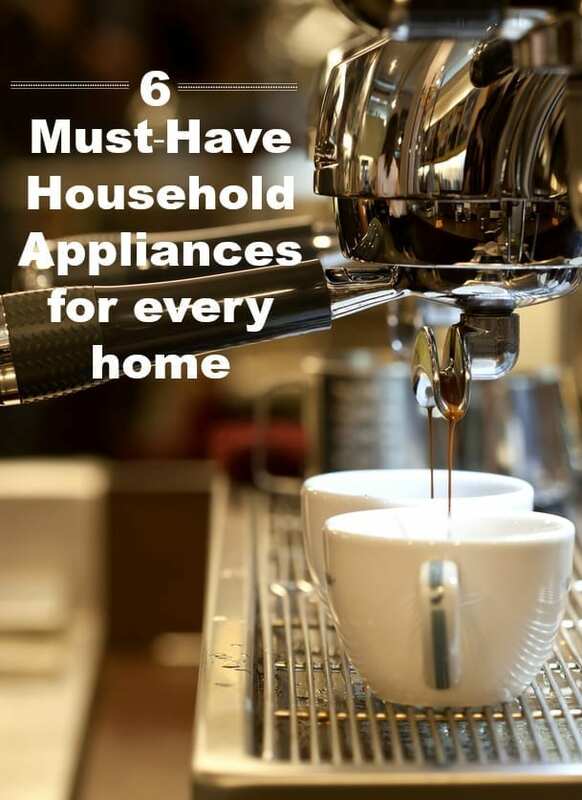 What would you add to your must have household appliances list? Have I missed anything crucial? I am a slow cooker convert. It’s amazing how you throw everything in and it comes out delicious and the meat is so tender. I Couldn’t make it without my food processor! I use it for everything. I do a lot of cooking & find it an absolute necessity. One word defines your message: Simplicity. You can’t beat the basics when it comes to your home. But there are in this modern age certain bare minimums we feel we cant’ live without. I like the idea of a cordless vacuum, especially when doing stairs. A slow cooker is one of those things you never appreciate until you’ve used one a few times. My favorite is ribs. You can throw them in with some BBQ sauce and go to work. Come home and it’s ready! I love that you add coffee maker at #6 but put the image first. This appliance really create more value at our home with style. I’d have to say, all of the items on your list are definitely must haves for any home but I have a very soft spot in my life for slow cookers. I’ve only been introduced to them for a few month but they’re amazing! I can’t believe I waited so long to get one! For me its a clothes dryer for those winter months where the clothes wont dry. It does use a lot of power though so use it sparingly.